As usual, being on a budget, when it came to buying a tile saw I opted to visit the local hardware and see what was on offer. A little unsure about exactly what I needed, as I hadn’t actually done any sawing of glass with a diamond saw, I looked over the various saws available. Surprisingly, they didn’t have that many, but the price difference was substantial. Guess what? I chose the cheapest saw and hoped for the best. Things didn’t go quite to plan, but they didn’t work out too bad either. The saw I chose was a very basic tile saw. It had no fancy bits and the construction was very basic, as you can see in the photo. Note, the black top is not original. You can see the shiny metal of the original table top around the edges. This is explained a little further on. The blade it came with was, naturally, suitable for sawing tiles, but not glass. Out of curiosity I tried it but unsurprisingly it chattered badly and chipped the edges of the glass. Sure, it cut the glass, but the edges needs a lot of grinding to make acceptable. The solution was to purchase a new thinner blade suitable for glass. An on line lapidary supplies site provide the solution in a 0.025″ continuous rim blade. The shaft size was different so I had to purchase a shim to make up the difference. Once I received the new blade I attempted to fit it and found a that I also needed to add a spacer to the back of the blade to ensure the shim stayed in place. The design of the flanges that hold the blade has a cavity behind the blade which allowed the shim to move backwards and away from the blade. The result being the blade no longer had the shim and it simply moved off centre. A search through my collection of washers provided the solution. Once everything was fine I tried to cut some glass and it all worked beautifully. sort of. When I tried to cut small pieces I found another issue with the metal saw table. On the right of the blade the table extended up close to the saw blade, but on the left it stopped short by about 8mm. This didn’t matter with large pieces, but small pieces were not supported properly on the left and once the cut completed there was the danger that the piece on the left would drop down slightly and jam against the blade. This did happen once, but fortunately no damage to me or the blade. But it had to be fixed. This had me stumped for a while as I considered several ways to fill that gap. Then one day inspiration struck. Don’t fill the gap, add another top over the existing one that did extend close to the saw blade. I could cut a slot so it cleared the blade with minimal clearance, ensuring the glass would be supported both sides. So I considered several materials and methods to attach it to the saw table. Laminate was an option, but attaching it was an issue. I didn’t want to permanently glue anything. Timber was out in a wet environment and I didn’t really have anything else suitable. After looking at some options I decided the best solution was to use a left over black vinyl tile from laying our bathroom floor and using double-sided tape to attach it. Being vinyl I could cut it easily and the surface would be forgiving. The tape would allow me to remove it if replacement became necessary. These tiles are a heavy duty 300mm square by 3mm thick tile, and the perfect size to fit the table, with a little adjustment. Using a Stanley knife I cut the tile to fit between the rulers on the saw table, and then cut out a slot to fit around the blade. 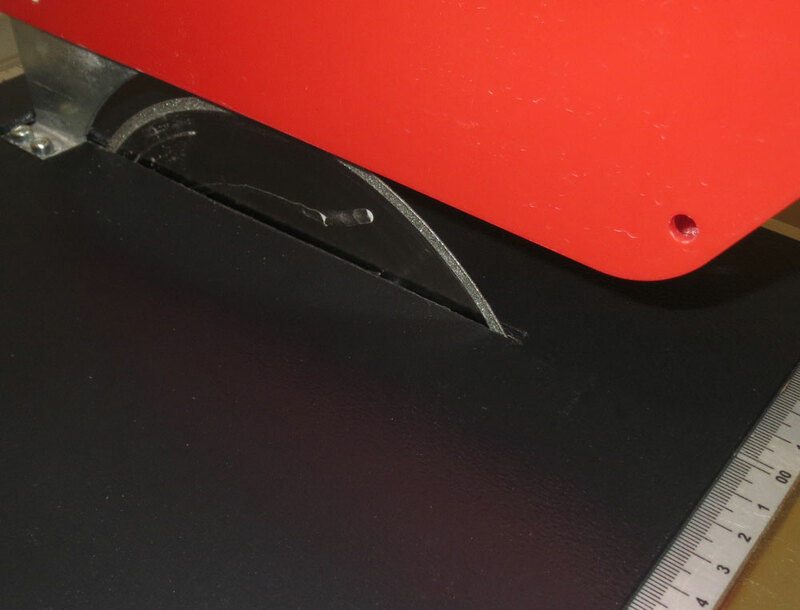 Using double-sided tape I carefully position and stuck the tile to the metal saw table. 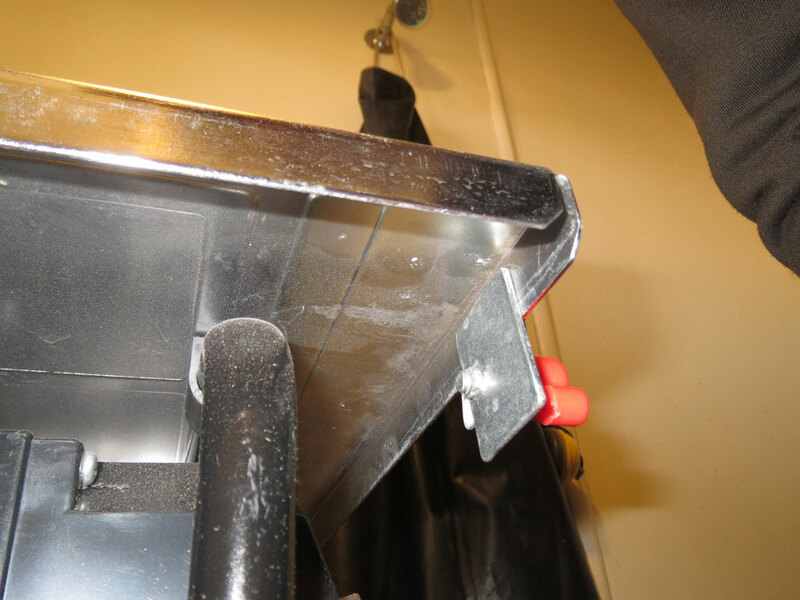 When it came to fitting the guide the extra thickness of the saw table was easily fixed by rotating the plates that the guide screws into just 90 degrees. This gave more clearance and the guides fit beautifully. First I tested a larger piece of glass and it worked great. The water lubrication worked fine and the vinyl surface was excellent for sliding the glass. Then the main test, cutting a small piece of glass. Put simply, It worked perfectly. In summary, the saw turned out to be a pretty good solution for a budget price. But I did learn a few things to look out for if I ever buy another. Check your saw to make sure it can accommodate thinner blades. Check the shaft size of the saw and new blade. You may need to purchase a shim to make up the difference. Make sure your new blade is continuous and not notched. Notched blades are VERY BAD for glass. Check the clearance between the blade and the saw table. 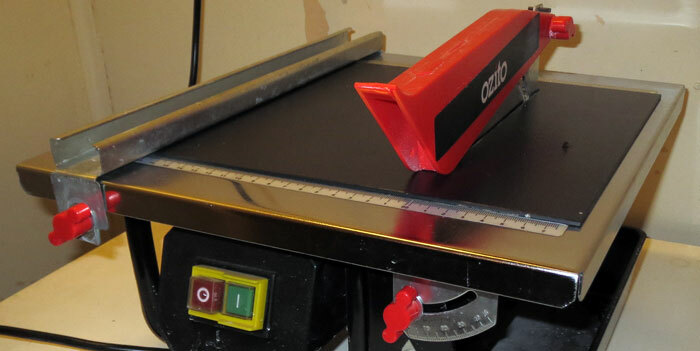 If you intend cutting small pieces of glass the table must support the glass close to the blade. It is dangerous to you and your glass if it is not fully supported throughout the cut.